The Pomeranian is a tiny, fluffy dog with a wedge-shaped head and pointed erect ears. Some have faces that breeders liken to a fox; others have baby-doll or "pansy" faces. All have bright, dark, almond-shaped eyes with an intelligent expression. The nose is either dark or the color of its coat. The teeth should meet in a scissors bite. 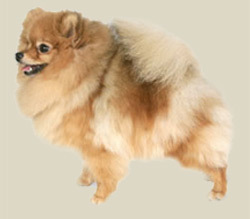 Poms also boast a distinctive feathered tail that fans forward over the back. There is an abundant ruff around the neck and chest area. The profuse stand-off double coat usually comes in solid colors. Any solid color is allowed, but the most common are red, orange, white or cream, blue, brown or black. Sometimes the coat is parti-colored (white with colored markings), black & tan, wolf or orange sable. The Pomeranian is active but diminutive, needing daily exercise but able to meet its needs with indoor games or short walks. Although it has a warm coat, it is too small and too family-oriented to live as an outdoor dog. Its double coat needs brushing twice weekly, more when shedding.